The strategy, announced yesterday, came with a series of innovations that Cisco says will remove today’s data centre boundaries. Cisco introduced support for its Application Centric Infrastructure (ACI) virtualized networking in Amazon Web Service (AWS) and Microsoft Azure clouds. Additionally, it launched new HyperFlex hyperconverged compute and storage options for remote and branch locations, as well as the CloudCenter suite software, now available as a managed service to simplify multicloud management. Public and private clouds are now equally as important as centralized data centres, Dan McGinnis, Cisco’s head of product marketing for networking, told CDN, and that’s what the latest innovations focus on. Data Center Anywhere will remove data centre boundaries, according to Cisco. This momentous shift is challenging for IT teams who have to decide between sticking with their on-premises data centres and a familiar set of tools for automation and security, or move to the cloud, which has its advantages, but makes consistent data compliance a challenge. 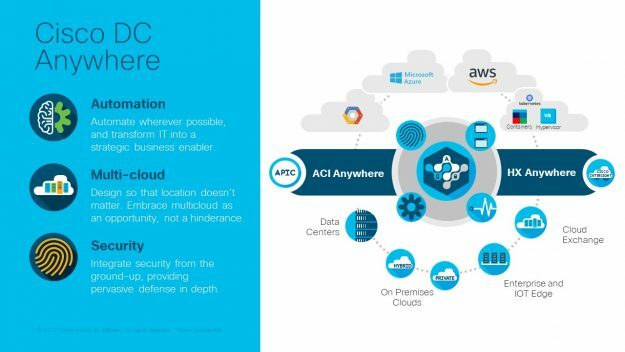 Network managers will soon be able to use ACI tools to manage virtualized networks on AWS and Azure, which goes beyond simply connecting to those environments, explained McGinnis. Cisco has also strongly hinted that support for Google Cloud Platform will be available down the road. Since its release in 2016, Cisco has been working hard to ensure a wide variety of workloads, such as SAP Hana, for example, play well with the company’s hyperconverged solution, HyperFlex, said Todd Brannon, senior director of data centre marketing at Cisco. “We’ve got customers that range up into the thousands of remote sites, particularly in retail and energy, and we’ve created an ultralight version of this edge solution that pivots off of our core unique differentiator for HyperFlex, which is that it’s cloud managed, and this is very unique in the industry,” he said. CloudCenter suite, Brannon added, is packaged into containers to make it easier for organizations to deploy the software. It also provides real-time cost optimization to help organizations manage cloud workloads on the fly and between multiple cloud providers. This is a huge boost for channel partners, Nirav Sheth told CDN, and provides them with flexible consumption options. Customers can take advantage of a single standardized three-or five-year licensing agreement across seven suites, including ACI, HyperFlex, Intersight and Tetration. Kent MacDonald, senior vice-president of strategic alliances for Long View Systems, a Cisco partner, said he’s been pleased with Cisco’s latest announcements and what it means for customers. “Customers are looking for more control and simplicity over their workloads and applications, regardless of where their data resides. And I think [Cisco] is living up to their marketing when it comes to being the bridge between legacy environments and the cloud,” he said.